PIERRE, S.D. (AP) — South Dakota Gov. Kristi Noem said Monday that she’s proposing a new framework for oil pipeline construction before building starts on the Keystone XL pipeline, introducing legislation that would require companies behind such projects to chip in on protest-related expenses and create a way to go after the money of those who fund destructive demonstrations. Noem said she wants make sure there’s enough funding so local governments don’t bankrupt themselves during construction. She also wants officials to be able to aggressively pursue people who financially back violence and gain access to those funds as well. The push comes late in the state’s 2019 legislative session, timing that critics panned. Noem’s bills come after opponents of the Dakota Access oil pipeline staged large protests that resulted in 761 arrests in southern North Dakota over a six-month span beginning in late 2016. The state spent tens of millions of dollars policing the protests. Officials are working hard to make sure disruptive and violent protests don’t happen in South Dakota with Keystone XL, Noem said. 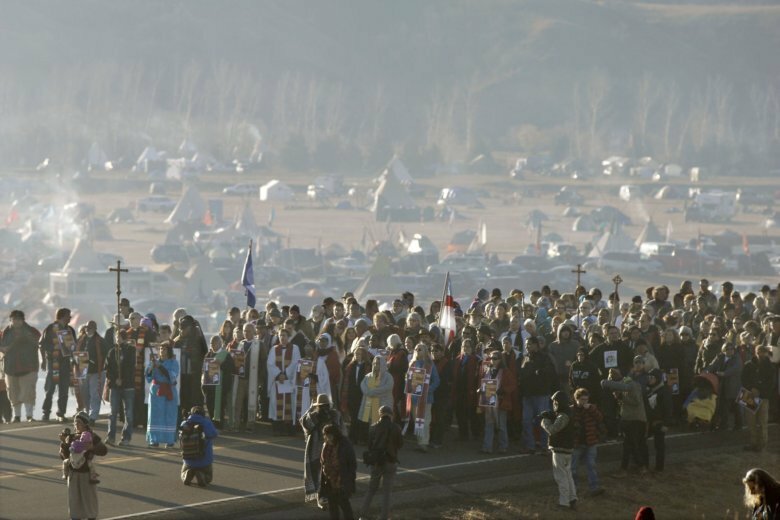 One bill would tap a pipeline developer, among other sources, to fund expenses in areas such as law enforcement that arise from pipeline protests. Approved claims from the state, cities or counties would be billed to the pipeline developer, which could contest the claims. If the state or local governments were reimbursed from another source for the claim, the money would be credited to the pipeline company. The other bill would create an avenue for the state to seek money from people who engage in “riot boosting.” Under the bill, individuals or groups would be liable if they encouraged people in a riot to be violent. Money collected would be used to pay for riot damage claims or could be transferred into a pipeline expense fund. Officials have already changed state law in anticipation of Keystone XL protests. In 2017, they made it a Class 1 misdemeanor for someone to stand in the highway to stop traffic or to trespass in a posted emergency area. That was a scaled-back version of a bill championed by then-Gov. Dennis Daugaard amid concerns about large demonstrations similar to the Dakota Access protests. Noem’s office said her bills arose from discussions with lawmakers, authorities, stakeholders and pipeline developer TransCanada. The 1,184-mile (1,900 kilometer) pipeline is intended to ship up to 830,000 barrels a day of Canadian crude through Montana and South Dakota to Nebraska, where it would connect with lines to carry oil to Gulf Coast refineries. Rebecca Terk, a lobbyist for conservation and family agriculture group Dakota Rural Action, said the legislation is an “incredible overreach” and the bills conflate protest with rioting. The developer of the Dakota Access pipeline last month sued the environmental group Greenpeace in North Dakota. Energy Transfer Partners accused the group and activists of conspiring to use illegal and violent means to disrupt construction, and of benefiting from the ensuing publicity to increase donations.